MILES MCENERY GALLERY presents an exhibition of works by JUDY PFAFF, on view at 520 West 21st Street. The exhibition is accompanied by a fully illustrated catalogue, featuring an essay by David Levi Strauss. Often considered a pioneer of installation art, Judy Pfaff’s limitlessly innovative work evades categorization and breaks boundaries. In the early 1970s, while she was enrolled in the painting MFA program at Yale, renowned artist Al Held became her lifelong mentor and encouraged her to move beyond the limitations of the picture plane—an idea which she took to exceptional new heights. Oscillating between the two- dimensional and three-dimensional, Judy Pfaff’s installations react to and penetrate the spaces they inhabit, transforming them into explosively dynamic environments that entice and engage the viewers’ senses. Pulling from a variety of disciplines—including sculpture, painting, and printmaking—Judy Pfaff’s works are unrestricted by the use of a single medium. In utilizing a diverse range of materials, Judy Pfaff is able to draw inspiration from the realms of both the natural and the spiritual, as well as art historical imagery, and represent their essence in a distinctive and engaging manner. The title of Irving Sandler’s monograph, Judy Pfaff: Tracking the Cosmos, hints at the broad reach of Judy Pfaff’s art. Quartet, her major work in the exhibition at Miles McEnery Gallery, is the newest manifestation of the artist’s ambitious quest to investigate nature, life, and human experience to their fullest. Created from a rich primordial soup of materials, the artist has produced an opulent set of works that she refers to as “wall installs”— tamer translations of the installations she is known for. 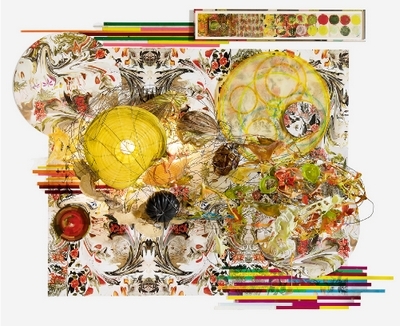 Forever thinking outside of the box, Judy Pfaff uses a tsunami of materials and objects made and found; photographically derived digital images on paper to aluminum disks, wire fencing, acrylic, melted plastic, paper lanterns, fungus, artificial flowers, electric lighting, encaustics, and more. Complex and captivating, they create an experience that is both visual and tactile, inviting focused contemplation to fully perceive their many intricate parts. JUDY PFAFF was born in London in 1946. She received her Bachelor of Fine Arts degree from Washington University in St. Louis, MO in 1971 and graduated from Yale University with a Master of Fine Arts degree in 1973. Judy Pfaff has had over 100 major solo installations across the country and abroad at such venues as the Chazen Museum of Art, University of Wisconsin, Madison, WI; the Denver Art Museum, Denver, CO; the St. Louis Art Museum, St. Louis, MO; the Albright-Knox Art Gallery, Buffalo, NY; Contemporary Arts Center, Cincinnati, OH; and the Hirshhorn Museum and Sculpture Garden, Washington, D.C.
Judy Pfaff was the represented artist for the United States in the 1998 São Paolo Biennial. Her work is included in many public and private collections including the Albright-Knox Art Gallery, Buffalo, NY; Brooklyn Museum, Brooklyn, NY; Detroit Institute of Arts, Detroit, MI; High Museum of Art , Atlanta, G A; Chazen Museum of Art , Madison, WI; Museum of Modern Art , New York, N Y; Whitney Museum of American Art, New York, NY and National Museum of Women in the Arts, Washington, D.C.
Judy Pfaff is the recipient of numerous awards including the Lifetime Achievement Award from the International Sculpture Center (2014); a MacArthur Fellowship (2004); an Award of Merit Gold Medal for Sculpture from the American Academy of Arts and Letters, New York (2002); a Bessie Award (1984); and a Guggenheim Fellowship (1983), as well as two grants from the National Endowment for the Arts (1979 and 1986). She is the Richard B. Fisher Professor in the Arts and Co-Chair of the Studio Arts Program at Bard College, Annandale-on-Hudson, NY. Recently, Judy Pfaff was the visiting artist in the Walter Gropius Master Artist Series at the Huntington Museum of Art in Huntington, WV. The artist currently lives and works in Kingston and Tivoli, NY.